I have been wanting to write a stage adaptation of Jane Austen’s Sense & Sensibility for several years. It’s a compelling story, but compelling in a different way than the more famous Pride & Prejudice. The title, for instance, does not refer to the lead romantic pair but rather to the two lead sisters, Elinor and Marianne. It was a daunting task: the novel is nearly 120,000 words long, has well over twenty characters and includes multiple settings, from a drawing room in London to a rainy heath in Devonshire. To turn all this into a play, I knew I would have to find a through-line, a thematic guide of sorts, before I could actually begin writing. If I didn’t, it would be too messy—the script wouldn’t have a focus. I needed to decide what my interpretation of this story would be. I found this guide in the form of the titular characters, Elinor and Marianne. Elinor is the sense, reserved and serious, an unlikely heroine. Marianne is the sensibility, romantic and free-spirited. (Ros Ballister, who wrote the introduction to the Penguin Classics edition of the novel that I used for my adaptation, explains that “heroines of sensibility prefer their cottages ruined, their fields suffocated by dead leaves…so that they can focus on the complexities of their own experience.”) Both sisters are convinced that their way of looking at the world is right, and both are frustrated that the other doesn’t understand this. It is their relationship, and how they help transform one another, that I chose to be at the heart of my version of the story. My post-adaptation copy of Sense & Sensibility. Once I got down to the writing, it was a lot of start-stop-start-stop. There really wasn’t any other way to do it. A novel contains so much material that I found it impossible to conceive of how to adapt it all at once—it just takes time to work through. I decided early on that rather than try to hide the fact that this would be in a theatre, I would embrace it. I tried to emphasize the theatricality, not only in the scenes but in the moments between the scenes. I tried to imagine how characters could move through times and locations on a stage, hoping that this would eventually be part of the flow of the performance. Some scenes could be written with very little adaptation. For example, there is an exchange in Chapter II between the characters John and Fanny Dashwood, where Fanny talks John out of giving money to his sisters. Writing this scene was easy: by and large, it was just a matter of trimming down the dialogue from the book, as Austen had written the scene entirely. Other scenes were not depicted so directly; they were implied in the narrative. For those, I mined the text as much as possible for bits and pieces to turn into dialogue. Austen’s syntax and turns of phrase are distinct, and I wanted to by and large stick with her dialect. Austen does not use contractions as frequently as we do now, for example, and her vocabulary which is rich and varied, is also at times archaic (to us now, at least). This is an important scene, both because it reveals the character of Mrs. Dashwood and Elinor, but also because it’s important to the plot. Why would Mrs. Dashwood not leave her home of Norland now that it’s been invaded by her repulsive daughter-in-law, Fanny? It’s important that they stay, though, because if they do not, they will not meet Edward Ferrars, Fanny’s brother, whose arrival changes the whole story. So I knew it was important to include this scene in my play. MRS. DASHWOOD: I shall not be degraded to the condition of visitor in my own home. We must quit this house forever! ELINOR: No, Mama, we cannot. MRS. DASHWOOD: We most certainly can. ELINOR: Mama, please. Reflect on the propriety of leaving at this time. MRS. DASHWOOD: Propriety? Surely you cannot condone such behaviour. ELINOR: No, of course not. But other scenes were far more difficult. In a novel, a reader gets a lot of detail but has more time to absorb the information. A play, by contrast, has less detail and moves far faster. But a key aspect of drama is that the work can suffer if key moments are talked of instead of dramatized—the nature of drama is, after all, to show the story, not to tell it. There was a growing attachment between her [Mrs. Dashwood’s] eldest girl and the brother of Mrs. John Dashwood, a gentlemanlike and pleasing young man who was introduced to their acquaintance soon after his sister’s establishment at Norland. In this single sentence, several events are summarized: Edward’s arrival to Norland, his introduction to the Dashwood’s and in particular his introduction to Elinor, and the scenes in which he and Elinor have fallen in love! 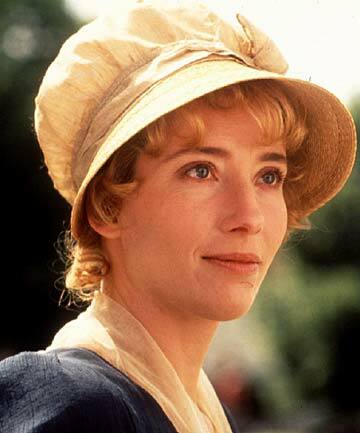 Emma Thompson in the 1995 film adaptation of Sense & Sensibility. Thompson played Elinor and wrote the screenplay, for which she won an Oscar. EDWARD: I hope I am not intruding at - at this time. FANNY: Oh, Edward, don't be silly. You could never be an intrusion. ELINOR: We are only responding to our letters, Mr. Ferrars. It is no inconvenience. EDWARD: Forgive me, but I meant in - in this time of... bereavement. Please allow me to convey my deepest sympathy to you, Mrs. Dashwood, and to your daughters, for your recent loss. I never met Mr. Dashwood, but by all accounts, he - he was a kind, generous man. MRS. DASHWOOD: Thank you, Mr. Ferrars. It is most kind of you to say so. MARGARET: This was his favourite room. EDWARD: Was it? Yes, yes, I can see why. A most charming room - with a - a fine prospect over the park and gardens. MARGARET: That’s what Papa always said. Does this establish Edward as gentlemanlike and pleasing? I hope so. It’s been a challenge writing the script, but, at the risk of sounding corny, it’s been a labour of love. I’ve had a unique opportunity in bringing to life Austen’s remarkable world, her cast of characters, and story that was written over two-hundred years ago—a story that still moves us today. I’ve been lucky to work with Bob Frazer, whose insight into the script has helped me tremendously with re-writes, and whose direction has embraced my approach to the story and helped realize it on stage in more ways than I first imagined. I also owe a huge thank you to the cast. They are acting students still in theatre school, but have tackled this project with the dedication of professionals. Their work has been formative—vital, actually—to the script. They have jumped headfirst into rehearsals with a script still in flux, accepting at times substantial re-writes not only without complaint but with tenacity and care. They have offered up their full hearts to the play, which is what, I think, Jane Austen would have hoped for. We open this week (Friday, November 16) at the Blue Shore Centre for Performing Arts at Capilano University in North Vancouver.